Turtles are the stars of the show this summer…and many different species call the Aquarium home. 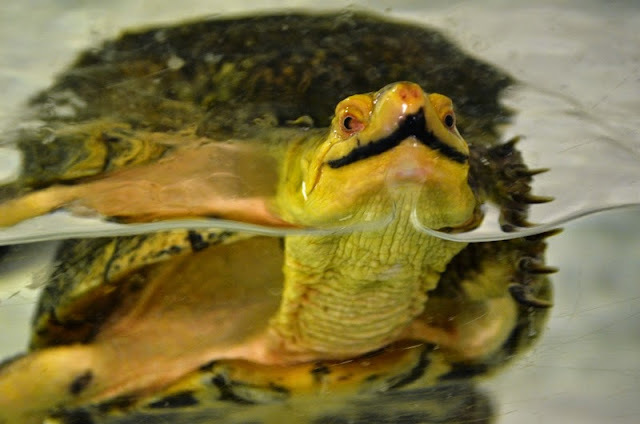 Some turtles are on exhibit full-time while some of turtles only make special appearances. One of these special guests is a local freshwater Blanding’s turtle named Skip! 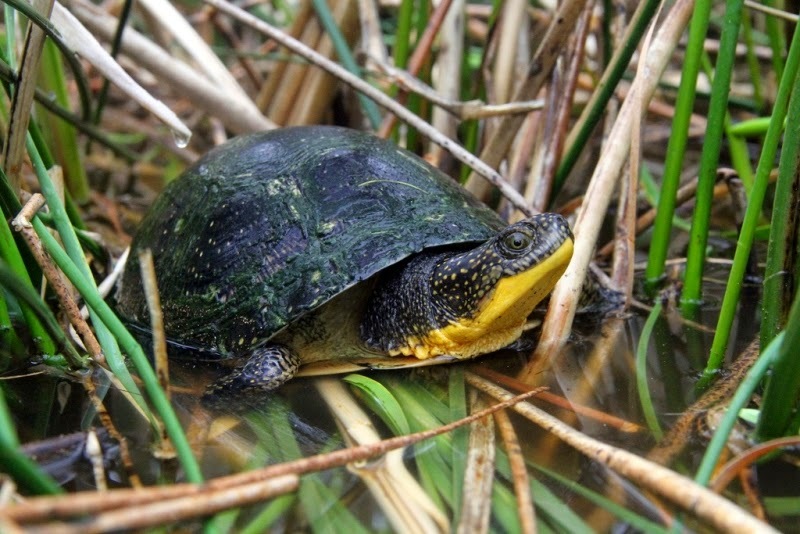 Named for the naturalist who discovered them in the 1800’s, Blanding’s turtles can be found in wetland areas, like ponds and marshes, from Massachusetts through the Great Lakes. Even though they have a big range, they face some tough challenges and their numbers have dropped over the past several decades. There are now only pockets of them left, including some in Massachusetts. 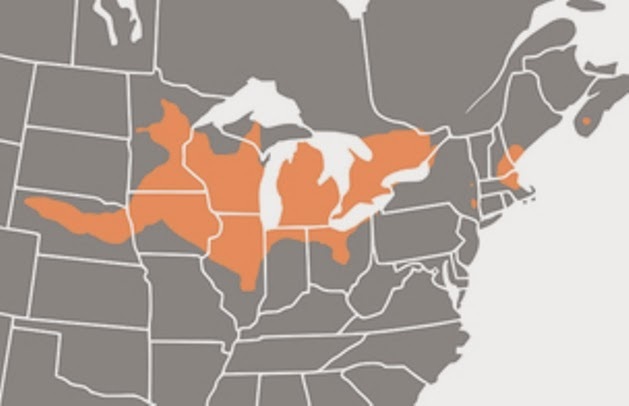 One biggest challenge for Blanding’s turtles? It’s something we use every day…roads! Imagine trying to cross a busy highway on foot. Not easy, right? Roads make life tricky for many species. 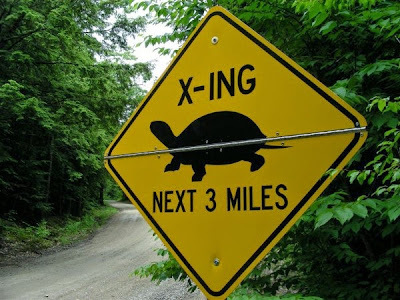 Blanding’s turtles will move a mile or two to find food, mates and nesting sites, so crossing roads is a necessary part of life…but it’s also dangerous. Many are hit by cars and don’t survive. Fortunately, there are communities working with state transportation departments to install road signs that warn motorists of Blanding’s turtles in the area as well as building fences around nesting locations in hopes of reducing road mortality. You too can help! 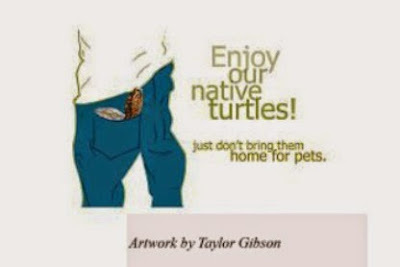 If you see a turtle crossing a road, first make sure it is safe for you to move the turtle. Then pick the turtle up and move it to the other side of the road, making sure to maintain direction and place it in the direction it was heading. If these turtles are threatened in Massachusetts, then why do we keep two here at the Aquarium? One of our turtles, Skip, was found by a family who decided to bring him home as a pet. Not a good idea! 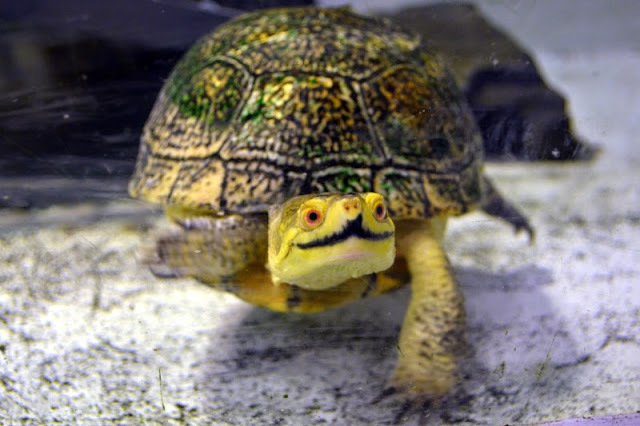 It’s illegal to remove a threatened or endangered species from the wild, so state wildlife officials confiscated the turtle and brought him here. Skip can't return to the wild for a couple of reasons. First, we don't know what population he came from, and second he may have been exposed to diseases that he could transmit to native populations. As there were concerns about his ability to survive in the wild, the decision was made to give him a forever home on Central Wharf! Skip, and all of our other turtles, are well taken care of by Aquarium staff, with lots of space to swim and gourmet meals of worms, fruits, veggies, crickets and more. He is visited by our Marine Mammal trainers, who work with him during enrichment sessions to keep his mind sharp and feed him a snack (check out the video). Skip even gets “shell-icures”, having his shell scrubbed with a toothbrush. 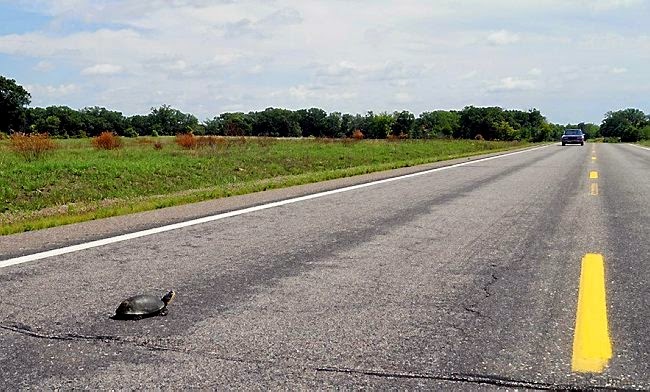 And in return for his prime accommodations, Skip is an ambassador for his wild Blanding’s turtle counterparts, showcasing how we can all help turtles, even it’s helping them to cross the road. The Aquarium is all turtle, all the time this summer. But there are still thousands of other animals, just swimming there and being fascinating! 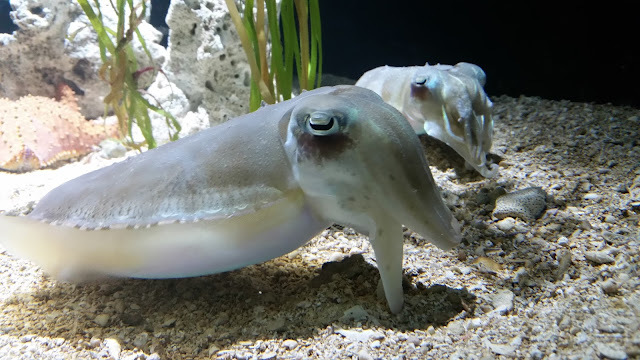 Just this week, the pharaoh cuttlefish began laying eggs. It's a process that can take a couple days. Luckily, aquarist Brianne Dent was on hand to record a quick video of this special event! These eggs should be fertilized since Brianne has observed breeding behavior between individuals. Visit in the next few days and you might be able to see the eggs! They will probably only stay on exhibit for a few days so they can mature and stabilize a bit. But as soon as it's save, the aquarists will take the eggs behind the scenes—away from the hungry mouths of the urchins. Behind the scenes, the eggs will go into a holding tank and we will rear them behind the scenes for the next generation of pharaoh cuttlefish for the exhibit! The animals on exhibit are currently from wild caught eggs that were hatched out by our colleagues at a fellow aquarium. That means they have good genetic stock and aren’t too inbred, which can be a problem with captive cuttlefish. See pictures of the pharaoh cuttlefish when the were tinier. The wildest slow-motion cuttlefish video you'll see. Ever. Get to know the common cuttlefish with some gee-whiz fun facts. One time the dwarf cuttlefish laid eggs, too.